This grown-up Bountiful Wonders Coloring book is chock full of Fall-themed and Thanksgiving-themed designs. In fact, I think it would be a great activity for the family while they are digesting the holiday meal. You provide the pencils and markers and each person can take a page to color. In this book, there are 24 designs with 16 that are full page repeating patterns and 8 that are coloring pages with individual unique designs. Most of the designs are quite intricate and challenging. They will require fine tip markers or pencils. Several, however, are more simple and will be easier to color. The background on all the pages is white. The images are printed on the front of the page only. Each page is perforated for easy removal. The printing quality is excellent and the paper is nice and thick. There is great information on the inside front cover about use of color and on the inside back cover there are some very helpful coloring tips. Subjects in the collection include: turkeys, pumpkins, acorns, leaves, fruits and vegetables, mushrooms, fall foods, and owls. So there will be a wide variety to select from if you do decide to include this book in your family activities on Thanksgiving Day! Watch for a giveaway coming soon for my review copy of this book! 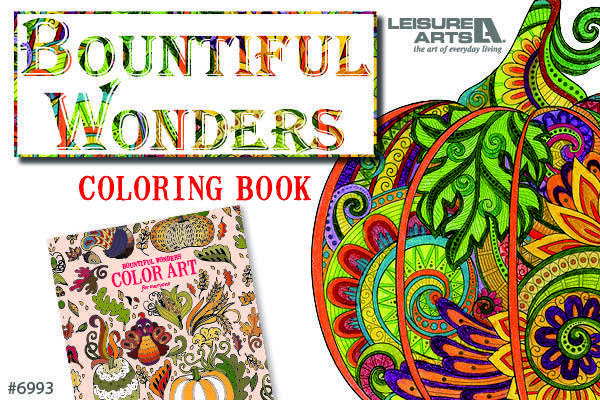 Note: Since Leisure Arts is one of my affiliates, if you purchase the Bountiful Wonders Coloring book, I may receive a small portions of the proceeds. I would love to see the fruits and vegetables...and everything else. IT is very nice to know that the pages are perforated! I think the owls attract me the most, but so do the pumpkins! Oh, or turkeys. So many incredible options! I like that there is a range of detail levels, so even people who have trouble staying in the lines (possibly me lol) can do well. So cool!